Enter the current dividend per share. Use numeric characters 0-9 only, and a decimal point if applicable. Enter the current market price per share for the company you are researching. Use numeric characters 0-9 only, and a decimal point if applicable. Enter the calculated growth rate. Enter as a percentage without the percent sign (for 10%, enter 10). If you are not sure what the growth rate is, click the link in this row to open the Stock Growth Rate Calculator in a new window. This Stock Investment Calculator will calculate the expected rate of return given a stock's current dividend, current price per share, and the expected growth rate. If you don't know the answer to the question, "What is Expected Rate of Return? ", it may help to visit the Learn tab for information related to what expected rate of return is, how it's calculated, and what purpose it serves -- before using the calculator. Enter the current dividend per share. Enter the current price per share. Enter the stock growth percentage. Click the "Calculate Expected ROR" button. What ERR is and how it's calculated. In the case of stocks, expected rate of return (ERR) is a formula used to forecast the future return on investment from a stock purchase -- which includes income from both equity and dividend growth. 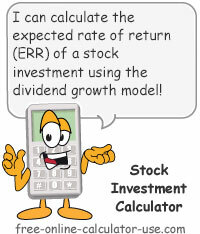 To calculate the ERR, you first add 1 to the decimal equivalent of the expected growth rate (R) and then multiply that result by the current dividend per share (DPS) to arrive at the future dividend per share. You then divide the future dividend by the current price per share (PPS), and then add the decimal equivalent of the expected growth rate to get the ERR. What is Expected Rate of Return Useful For? Since ERR is based on assumptions that rarely hold true, most investors use ERR to compare the potential returns of one stock investment with another. After all, the growth rate figure used in the ERR formula does account for the actual historical growth of a company's earnings per share. Therefore, using ERR to compare potential returns of investing in one company over another makes more sense (at least to me) than using a high expected rate of return as the sole reason for buying shares in a particular stock. The bottom line is, all methods of forecasting the potential return on investing in a stock are simply methods of making educated guesses. Sure, the better your educated guesses, the more you increase the odds that you will achieve a fair return for the risks you are taking. But there is no way to guarantee that some unforeseen event won't cause you to lose your principal in a short period of time.